Redmark Session 09: Marcus who? Marcus left to visit the brothers at the Temple of the Lots the evening before. Wanting to spend as much time as he could researching the Horn of Bugbearhalla and the Urthjarl stone. Quintos, Ghost Dancer, Ivamel, and Lundie awoke to a deep chill and grey morning sky. A light snow had covered the ground, the adventurers, and their steeds as they slept. As the three adventures broke their fast, they discussed what still needed to be done. More than just Bone Hill was on their minds. Rumors are swirling all around them. Each day seems to bring more urgency to their tasks. Rumors of magical beasts, towers of shadows, racial injustice in Nimroth, and what the Lady Sophia might find in her studies. 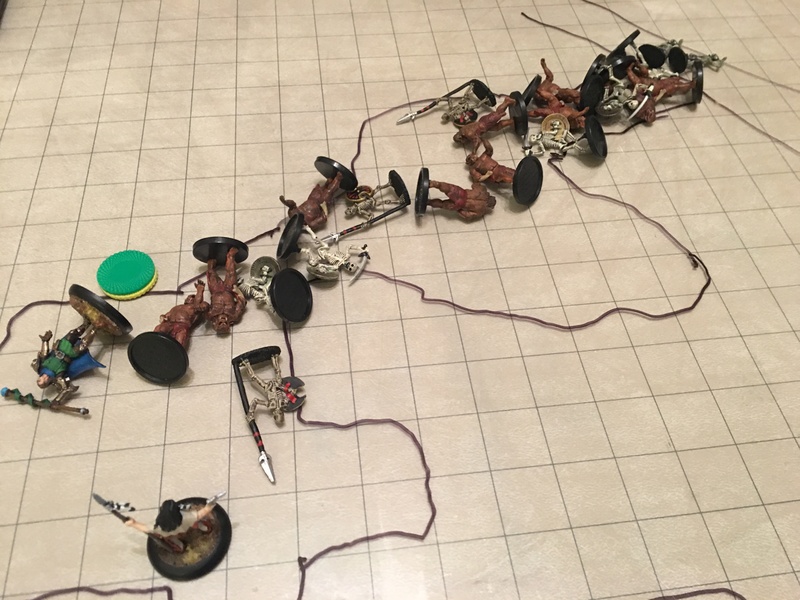 Our band of adventurers extinguishes the night’s fire and decides to handle the task in front of them. Not knowing what they may still yet find, they begin the trek back into the cursed lands that surround the ancient castle. As they descend back into the underground caverns the group thinks to check behind the door near the end of the stairs of the bottom level. Behind the door they find a ladder. Ghost Dancer nimbly climbs the ladder and sees that it leads to a hatch that opens into the remains of the siege tower that had been against the castles outer walls. He finds odd footsteps in the snow but decides to lock back the hatch and leave that trouble to the outside. 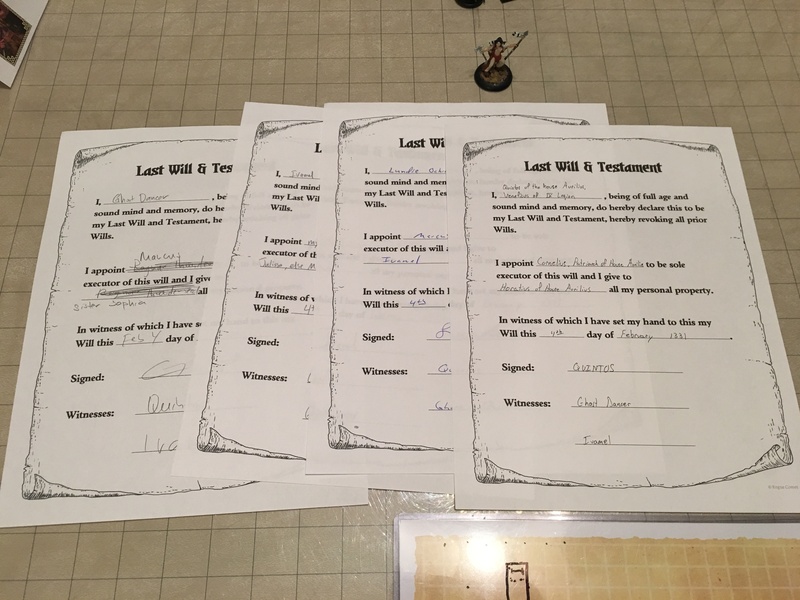 Players had to fill out their Last Will & Testament before the big encounter! Back into the depths the four head with the confidence of youth. Beyond yet another locked door they happen appears what runes that when examined closer appear to form a doorway. Quintos reads the symbols and confirms that it does indeed to be a doorway of some sorts. Ghost Dancer and Ivamel work together to open the door using what appears to be some sort of magical hand holds. The door slowly slides open and foul air rushes out. Lundie says a quiet prayer to Dumathoin, the dwarven god of buried secrets. The party descends more stairs and into a room. They feel the weight of evil on them; their weapons start to glow in a sinister blue light. Ghost Dancer moves forward wearily, his light spell only providing minimal light in this deep cavern. Lundie moves ahead to try and see the danger ahead in the dark without the source of evil gaining the upper hand. As Lundie edges closer he makes out a figure on a throne in the room before him. The evils of the world come full force on Lundie as his stare catches this creature. Lundie divines from his god Moradin that this is a dark undead evil, a wraith. Ivamel alerts the group to the sound of footsteps coming from behind them. 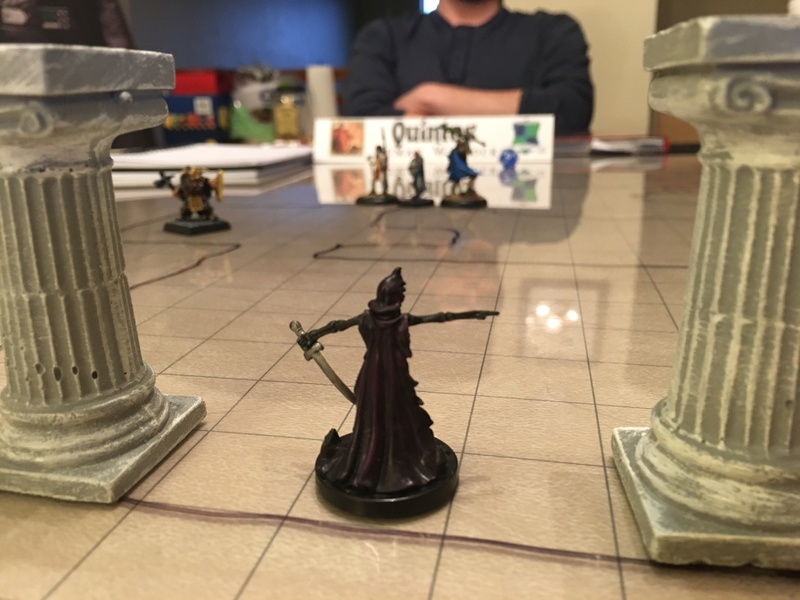 Quintos stands ram rod straight, “Guys, you handle this undead creature quickly. I’ll hold the back!” Ivamel and Lundie move forward slowly. Not knowing what to make of Qunitos’s command. A short time passes, “Go now! I mean this!” Quintos barks out. His three fellows feel the earnestness in Quintos and jump into action. Lundie pray-begs Moradin to turn this evil creature and slowly enters the room. Ivamel runs to directly in front of the dark creature. The creature only moves to run away from the glowing emblem of Moradin on Lundie’s shield. Ghost Dancer moves quietly into the room, keeping his distance safe but within full range of his weapons. Lighting glows from behind and the crackle resounds through the rooms. Lundie charges the wraith, Ivamel swings again. Ghost Dancer casts a spell to guide Lundie and Ivamel in their strikes. The wraith is floating between this plane and another. Lundie again calls on Moradin to bless his weapon and slams a blow into the wraith, the radiant glow seeming to have a good effect. The wraith reaches for Ivamel, Ivamel shifts his weight in time and the creatures reach is not enough. This continues, every combantat doing their part. More flashes of lighting. Lundie yells out, “Quintos, come on man! We need you in here! In here! !” No answer for Lundie. Ghost Dancer times an arrow to land just as the wraith comes full into this plane. Ivamel commands Lundie to make a quick strike at just that same moment. Ivamel strikes as well. Lundie is then able to make his own attack on the back swing. All the damage mounting up, Lundie calls out again; “Quintos man, we need you in here man! !” Lundie’s pleas are met with just flashing lights and sounds of lighting and magic. Finally, Ivamel, Lundie, and Ghost Dancer are able to vanquish the wraith. 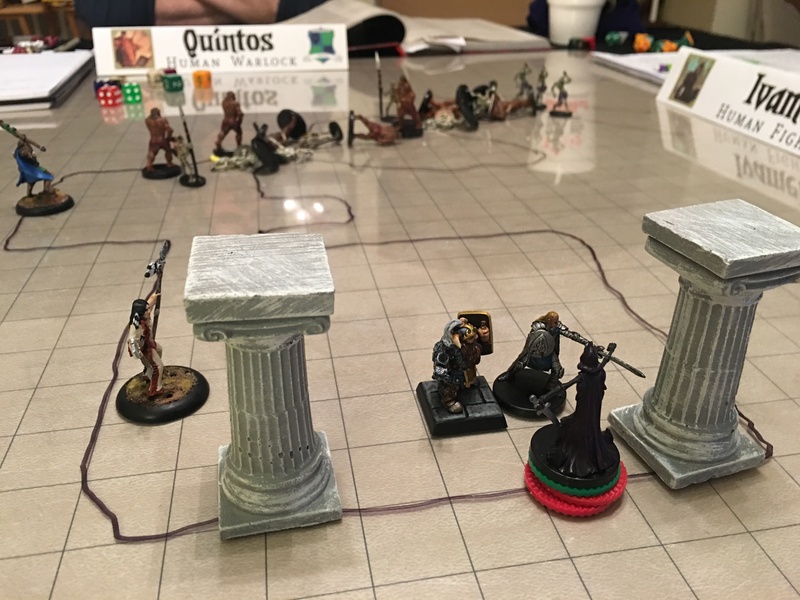 As they turn around to admonish Quintos for his lack of fight, they see a wide-eyed young man, sweat soaked, lighting staff glowing blue, and TWENTY dead bugbear zombies and skeletons across the floor. The closest one just 5 feet from Quintos the farthest all the way back to the door some 75 feet away! Quintos drops to the floor; Lundie walks over and places his hand on Quintos’ shoulder. “Well done, young man … very well done,” the dwarf gives a sly grin to Qunitos. Ivamel looks around, “So these all just stopped when we killed the wraith, right?”. Quintos looks around and with a broad smile says, “Who needs Marcus?! ?” Ghost Dancer starts the laughter for the friends. The four make it over to the tower the only place that has not been searched. Ivamel and Lundie lead the trek up the spiral stairs, to almost the third floor. When the old stairs give way and the two crash down. Ivamel looks up and says, “Look there…under the stairs.” Quintos lays down and starts to gather the bag, only to see it slip out of his grasp. The bag rips open and gold coins rain down on Lundie and Ivamel, both just laughing at the rain of gold. Ghost Dancer looks inside the bag to find a silver ring made to look like a wrapped feather, obviously of Elven making.